Cast: Eddie Murphy, Gabrielle Union, Elizabeth Banks, Scott Caan. Story: A human-shaped robot controlled by aliens lands on Earth. Expectation is everything. Meet Dave isn't a very good movie at all, but armed with the expectation that it would be horrible, I ended up quite enjoying it. 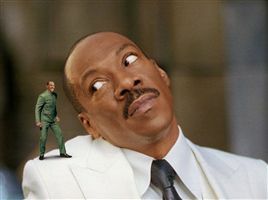 Eddie Murphy is a man-inside-a-man, an alien leader commanding his troops within the intergalactic spaceship that is Mr Murphy, struggling to fit in with the strange alien inhabitants of planet Earth. Making no attempt to actually make any proper sense, it's clearly aimed at kids, and dim ones at that, but nevertheless I did chortle a few times at the puerile humour. Sometimes crap can be accidentally fun. To enjoy this film you should have: poor expectations or a single figure age. Meet Dave was released in the UK on 18th July 2008.